Photo courtesy site BAY veteran. This is about preserving a tiny bit of mostly forgotten trivia which was a part of the history of the Cold War. This history is rapidly disappearing as the inevitable march of time progresses, so for the benefit of those that may come after us, the documents indexed by this page were created in an attempt to preserve some of what was witnessed by the men who were there. These pages are written from the human perspective of soldiers that simply lived and worked there and so most of the information is presented in the form of personal memories and anecdotes. As such, the form and content of these pages evolved over time as more information was collected as a result of my request for information from those that happened across these pages and cared to contribute their stories. The following is provided as a historical frame of reference. At the end of World War 2, the tension, mistrust, and competition between the western world and the communist Soviet Block of nations lead by the USSR increased to the point that intercontinental nuclear holocaust was a very real possibility. In fact the world political and military situation came very near that brink on more than one occasion. This competition was evidenced in many ways and resulted in not only the Korean conflict and the Vietnam war, but also in tremendous expenditures on both sides of the equation in a race to develop supremacy in military technology. This race even placed men on the moon. Another aspect of that arms race was the need for the United States to develop advanced air defense capability to neutralize any military attack by Soviet bombers. This resulted in the Nike series of anti-aircraft missiles, beginning with the Nike-Ajax, which was soon replaced by the much more capable Nike-Hercules. Others followed (Nike-Spartan, Nike-Zeus and Nike-Sprint) with an eye toward a more effective defense against Soviet ballistic missiles but these were never fully deployed due to the Anti-Ballistic Missile treaty, so it appears that the Nike-Hercules missile was the most capable and effective area defense missile ever fully deployed on U.S. soil. From the late 1950's through the early 1970's, Nike batteries were emplaced at about 145 installations surrounding major cities in the United States. As the longer range and nuclear-capable Hercules slowly replaced the smaller Ajax, many installations became redundant and were subsequently deactivated. As other strategic and defensive systems were developed and the political situation changed, the Hercules missile batteries were gradually deactivated as well, with the last of the continental United State's Hercules units under AADCOM being deactivated in 1974. However, the defensive requirements of NORAD kept two of these units active until July of 1979. One of these last battalions was stationed in Florida at Homestead AFB, and the other one was stationed at the Anchorage/Fort Richardson/Elmendorf AFB complex in Alaska. 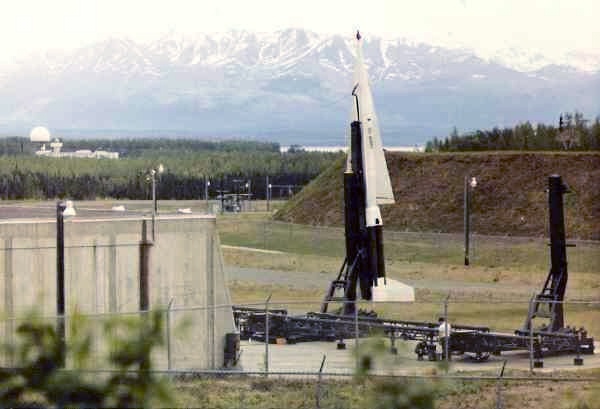 When the Alaska Nike batteries became operational in 1959 the defense included two battalions of Nike-Hercules organized under what became the 87th Artillery Group headquartered at Fort Richardson under the command of USARAL. One battalion was deployed to defend the Fairbanks/Eielson AFB area and the other was deployed to defend the Anchorage/Elmendorf AFB area. In addition there were two direct support ordinance companies that provided much needed maintenance and technical support services. For more about the 87th Artillery Group CLICK HERE (updated 12 June, 2010). ...consisted of a headquarters battery and three firing batteries, one of which (A) was a dual firing battery. This battalion was associated with the Fire Island NORAD Control Center until late 1969 and the King Salmon NCC after that. Maintenace support was provided in the beginning by the 194th Ordinance which was formed from Nike specialists in the San Fransisco area and transported to Alaska via Navy ship. This company was involved in the initial setup of the sites in 1958. The 524th Ordinance Company was formed sometime in the first half of 1964 and was placed under Artillery command (instead of Maintainance Battalion command) and served the Anchorage sites until they were deactivated in 1979. The battalion was redesignated as the 1st Battalion, 43rd Air Defense Artillery in 1971 after the 87th Artillery Group closed its doors and the Fairbanks sites were deactivated. The 1/43 ADA continued operations until it too was shut down in 1979. During that time it was organized under the 172nd Infantry Brigade. Click on the links below to visit webpages about each of the 43'rd ADA's Nike sites. of site history and AADCP operations. the great earthquake of 1964. Site Summit, Alaska - Nike Hercules ADA website, with added text. to the preservation of site Summit as a National Historic Site. And this is the new (as of March 2010) Friends of Nike Site Summit webpage. photographs of firing practice from McGregor Range. Details the history of the units that eventually made up the 43rd in the context of world events with discussion of the history of the US Army in Alaska and interesting details about the 120mm AA gun battalion that preceded and eventually absorbed into the Alaskan Nike missile units. Be advised this is a 3.4 meg pdf file. ...consisted of a headquarters battery and five firing batteries and was associated with the Murphy Dome NORAD Control Center. Maintenance support was provided by the 166th Ordinance. This battalion was deactivated in 1970-1971. Click on the links below to visit webpages about each of the 562nd's Nike sites. A new (2007) and extensive website about Site TARE. The source of this map is unknown, but it is included here gratefully. Research Notes, Nike Hercules in Alaska Provided by Colonel John H. Cloe, these are part of a larger document he worked on while employed as an Air Force historian at Elmendorf AFB. Now in html format, they provide a chronological perspective of the subject matter - well worth the read. CLICK HERE to visit the site. Nike Hercules Operations in Alaska 1959 -1979 a publication produced by the cultural affairs folks at Ft. Richardson in 2004 is now available as a free download from HERE. It comes as 10 separate .pdf files averaging about 1.5 meg each (from about 250K to 3.3 meg) and I'm sure you will find it very interesting and well worth the download time. 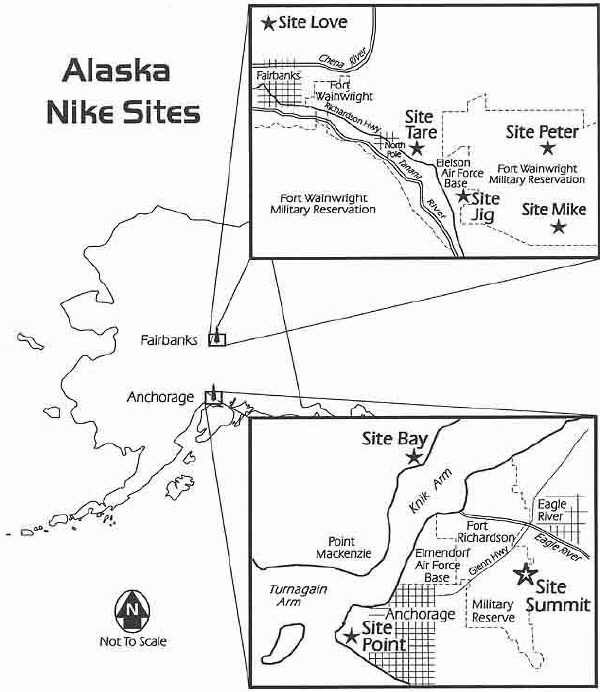 It contains many anecdotes and items of oral history from many who served at all of the Alaskan Nike sites. Overall I think they did a very good job with it though there are some errors here and there of fairly minor significance. Cold War Historical Context 1951-1991: Fort Richardson is an interesting 120-some-odd page document (about 6.7 meg .pdf file) that has some great historical perspective and old maps and descriptions of buildings at Ft. Richardson. It is available HERE. To view many recent photographs of some Alaskan Nike sites you can click on the following links. These pictures include the interiors of some of the buildings and were taken in the summer of 2003 by a couple of guys that like to explore odd abandoned buildings as a hobby: Site POINT, Site SUMMIT, Site SUMMIT (more), Site BAY, Site TARE, Site TARE (more). 30 minute video about Nike Hercules to be quite interesting. CLICK HERE to view it. This too is an interesting video showing many details of ARADCOM and the beginnings of the Nike Project: CLICK HERE to view it. Note that there are several formats, large and small; some suitable for burning a DVD. And here is another dated video regarding the early training of Army Missile Men: CLICK HERE to view it. Bristol, RI Nike Site with links to other Nike sites. In October of 2005 a work crew was bulldozing a new bike trail through site Point (what is now Kincaid Park) and unearthed, among other things, a damaged and discarded fin from a Nike-Hercules booster. The general consensus is that the fin was a part of a missile that was damaged during the great earthquake of 1964, misplaced during cleanup operations, buried with the other items, then subsequently discovered 41 years later. CLICK HERE to see photographs of this fin and the other items and a presentation detailing evidence suggesting a 1964 date for the fin's burial. To my great pleasure, this little project resulted in the reconnection of many old friends that otherwise would never have found each other as well as the enlightenment of many to the fading knowledge of the Nike mission in Alaska. And now, with the filling out of the last of them (Site Love) I consider this mission accomplished and concluded and have withdrawn my contact information. It is time to move on to other projects.